An anime that was released earlier this Summer, GATE follows Youji Itami, an Otaku whose life drastically changes when he is promoted to Second Lieutenant after helping save civilians from an invasion of monsters, medieval knights and other fantasy beings from another world who entered through a portal that appeared in Tokyo's Ginza district. But his reason for doing it was to prevent the event he was going to from being cancelled. He declares that his hobby is more of a priority than his job, and only works so that he can fuel his hobby. The anime starts off steady, as it switches between Itami as he is on his way to the event that's going on, and the portal as it slowly appears in the middle of the Ginza district. Itami is unaware of what's happening until he reaches a certain part of the station, and runs to the action as he tries to take care of the situation before the event is cancelled. And the next thing he knows, he is promoted to Second Lieutenant! He wonders how he got himself into the position that he's in, but uses it as a way to fuel his hobby. I like how the anime takes a different approach to the "main character becomes a hero by defeating a monster" concept, and features a main character that's not hot-headed or shy - he's pretty chilled out. It's these kind of changes to an already successful formula that make an anime more unique, such as Is it Wrong to Try to Pick Up Girls in a Dungeon? (MMORPG/RPG-turned-reality element where people join Familia (guilds) and party up so they can fight monsters in the Dungeon and level up etc.) and manga such as Boku no Hero Academia (kid who is a nobody but strives to be someone better by working to become a hero) and Namaikizakari (girl who is manager of basketball team meets a younger good looking guy who joins the basketball club and takes an interest in her, but she hates him (at first)). So hopefully, things will continue to be funny and interesting as I continue to watch the series. 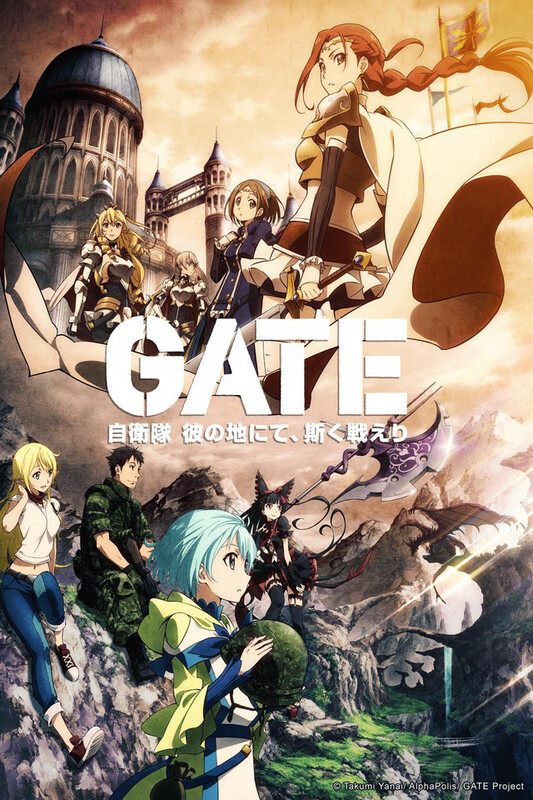 An Otaku is promoted to Second Lieutenant after saving the lives of civilians from an otherwordly invasion after a portal appeared.